A report “Review of UK Development Assistance for Security and Justice” recently released by the Independent Commission for Aid Impact is highly critical of DFID’s security and justice (S&J) assistance. It provides an overview of the UK’s priorities on rule of law reform, criticism of DFID’s police programs, and highlights successes with projects tackling violence against women and girls and broader legal empowerment initiatives. It also contains numerous critiques of the process DFID undertakes in providing and implementing S&J assistance. Security and justice (S&J) assistance, including support for policing, courts and community justice, is an increasingly important part of the UK aid portfolio. In recent years, the UK has funded substantial S&J programmes in 16 countries and smaller activities in a number of others. More of the UK’s bilateral aid is devoted to fragile and conflict-affected states and this trend is likely to continue. The FCO has a number of strategic programmes on S&J themes, including on human rights and counter-terrorism, while some of the UK Government’s domestic S&J agencies, including the Crown Prosecution Service and the National Crime Agency, have a range of international assistance activities. The concentration of UK S&J programming in fragile and conflict-affected states gives rise to a volatile environment for programme delivery. In recent years, DFID programmes have been cancelled or interrupted due to conflict (South Sudan, Libya), loss of political support (Ethiopia), human rights concerns (Democratic Republic of Congo) and a public health crisis (Sierra Leone). The data shows that the portfolio has grown from around £10 million in annual expenditure in 2000- 01 to £53 million today. Expenditure on legal and judicial development was stable or on a slightly declining trend from 2007-08 until 2013-14, when it increased again. Expenditure on security sector management and reform (including policing) has risen substantially over the past five years. 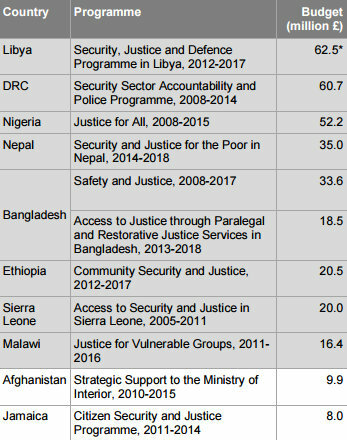 Most of DFID’s S&J portfolio is focused on criminal justice, with a concentration of funding on policing. There is also a substantial strand of programming on community justice, which can include supporting paralegal services, informal dispute resolution and ‘legal empowerment.’ There is less support for the formal justice sector and for civil justice. In recent times, DFID has begun to explore wider justice themes including land tenure, economic law and commercial justice. Programming in these areas, however, remains small. S&J assistance also supports conflict reduction. DFID has been very influential in establishing security sector reform as a discrete area of development assistance, covering the restoration of civilian law enforcement, democratic control over the armed forces and the disarming and demobilising of former combatants. In the S&J field, [Prime Minister David Cameron’s] ‘golden thread’ policy initiative has led to a renewed interest in the rule of law as a constitutional principle. It has also led to more emphasis on property rights and economic law. With the exception of the agenda to tackle violence against women and girls, there has been little development of S&J policy or strategy in recent years. The emphasis on service delivery steers DFID towards a widespread assumption that the solution to insecurity and injustice, is strengthening a specific set of S&J institutions and services, such as policing, courts and local tribunals. It works against approaching S&J as a set of social issues – for example, land tenure, labour rights or urban insecurity – requiring broad, multi-pronged interventions to address. Some of the experts whom we consulted stressed that poor people’s experiences of S&J have more to do with surrounding socio-economic conditions and cultural norms, than with the quality or accessibility of S&J services. We saw good evidence of this broader, multidisciplinary approach in DFID’s programming on violence against women and girls but less in other areas of the S&J portfolio. DFID informs us that it has chosen not to develop an overarching strategy for its S&J assistance, preferring to allow country offices to identify their own solutions to local challenges and opportunities, in order to respond to context. In the absence of clear guidance, however, we found that DFID S&J programmes tend to be fairly similar in composition, suggesting a lack of adaptation to context. Some repetition of successful activities have been replicated across countries. For example, the use of paralegals to tackle excessive pre-trial detention, which has worked well in Malawi, was taken to both Sierra Leone and Bangladesh – including using a Malawian NGO to deliver the training. In the community justice area, there is emerging evidence to support DFID’s theories of change. Other activities recur without due consideration of their track record or their suitability to different country contexts. DFID’s approach to community policing focuses more on supporting police with community outreach activities than on changing operational tactics (e.g. through crime prevention activities or increased patrolling in high-risk areas). This is despite limited evidence of success. Empirical studies confirm that entrenched police culture is not easily changed through training, particularly when externally initiated. If police are trained in new approaches and then returned to their former working conditions, colleagues and superiors, they quickly revert to old patterns of behaviour. There is also little evidence across the portfolio that behavioural changes introduced in model police stations are replicated elsewhere. For more evidence of capacity building programs for police, see page 25. Despite DFID’s strong focus on criminal justice, there is relatively little engagement across the portfolio with prosecutors, the judiciary, court administrations or the legal profession. The balance is tipped strongly towards justice in rural areas, even though rapid urbanisation in many countries is generating pressing new S&J challenges. Key stakeholders confirmed to us that these patterns of programming are a result of established preferences or ‘comfort zones’ among DFID and Stabilisation Unit staff and their regular consultant advisers. We find that DFID has made good progress on developing strategies to support this commitment. DFID has worked to map its existing programmes, assemble evidence on what works and develop guidance notes that identify programming options and possible entry points, including in particular sectors, with an overarching theory of change. We saw evidence that approaching the problem of violence against women via economic empowerment, particularly around land rights, can be a productive strategy in some environments. In Bangladesh, DFID has begun to address other pressing justice issues for women, such as the labour rights of textile workers. It is also starting to explore the S&J challenges facing women in urban slums. We saw little attention given to promoting attitude-change among men and boys and There is also scope for the programmes to distinguish between different types of perpetrator (intimate partners, acquaintances and strangers) and target their interventions accordingly. One of the differences is that it starts with a clearly defined problem – violence against women – and works back to possible solutions, giving it a more practical orientation. It also gives due attention to social norms and attitudes as barriers to change and a potential entry point for programming. In our view, DFID’s broader S&J portfolio would be strengthened by more detailed analysis of specific justice issues, such as land and housing tenure. The DFID programmes we examined seem to have made relatively little effort to consult with women and girls or to include them in programme governance or monitoring arrangements. While DFID is certainly making women and girls a major focus of its programming, its approach would be stronger if it were more consultative and participatory. There is scope for DFID to be more creative in involving women and women’s organisations in the design, governance and monitoring of its S&J programmes. Private contractors are generally preferred for large-scale programming. Large international companies are better equipped to manage DFID’s increasingly demanding contractual processes, particularly output-based contracting. They also have the resources to operate in insecure environments. As a result, the S&J portfolio is increasingly reliant on a small pool of large contractors. In our review of DFID’s use of contractors, their performance varies widely. At best, they can bring experience from around the world to bear on complex delivery challenges and harness the best of international and national expertise. Few large companies, however, have standing capacity in S&J. They tend to recruit for each contract, resulting in inconsistent performance. According to implementers, DFID tends to favour technical expertise over management experience or knowledge of the country context. As a result, programmes often experience high turnover of personnel in the first year, as the contractors and DFID negotiate to get a suitable team in place. We saw few examples of interaction between S&J programmes and DFID’s programmes on public financial management reform. On the whole, however, DFID does not give much attention to the budgetary side of S&J institutions, including the difficult problem of ‘right-sizing’ them according to the resources available in national budgets. We noted a preference for programmes that attempted to cover a wide geographical area and reach a larger population with standardised and relatively superficial interventions, rather than trying to achieve greater depth in a more focused geographical area. In Malawi, training to village tribunal members were provided on human rights awareness, legal issues and record keeping. We found this to be a project with considerable potential. Its scale and pace of delivery, however, meant that only a once-off, single day of training, or less, was offered to each tribunal to tackle matters of considerable complexity. Our consultations showed that there was considerable unmet demand for more in-depth training and that recall of topics covered in the training was limited. We were also surprised to find that the content of the programme was always the same, despite working across varied cultural environments. Procurement panels are not able to take account of evidence of past contractor performance when making their assessments. Technical assessments are, therefore, made purely on the basis of written bids. In many instances DFID is pursuing a narrow approach to community policing. Much of its community-policing work focuses directly on improving police-community relations – for example, by training specific community policing officers (Malawi) or holding police community forums (Bangladesh). Improving community-police relations may be an important goal, particularly in post-conflict settings where public mistrust of the police is high. We are not aware of any evidence, however, showing that outreach activities can deliver sustained increases in trust and confidence in the police and thereby in the legitimacy of the state, without much broader changes in police behaviour. DFID’s approach compares poorly to the more multi-dimensional approach taken by USAID in its programming in Central America, which involves working with a wider range of partners, including schools, churches and community groups. Changes in police tactics (such as problem-solving or ‘hot spot’ policing, targeting specific crimes in particular locations) are combined with other interventions, such as youth diversion programmes or improved street lighting, to create a more multidimensional approach to community security. In Malawi, the programme was strengthening traditional courts at the village level. It encouraged chiefs to hear cases in a panel with other village elders, including women. This had reportedly reduced the payment of bribes and encouraged more women to bring their complaints to the tribunal. The programme introduced casebooks for village courts to record their decisions. We were informed that this increased formality in the proceedings had helped to reduce arbitrary decision-making. Similar activities in Sierra Leone are also showing promising results, particularly in respect of the registration of customary marriages. In Malawi, the local justice work is beginning to show signs of reducing ‘land grabbing’ – that is, the practice of dispossessing women of their property after divorce or widowhood. According to data generated by the programme, across more than 2,000 tribunals trained, 85% of women involved in land claims are winning their cases against attempts to dispossess them, against a baseline of 60%. Our consultations with women claimants confirmed that the situation had improved substantially as regards property claims. In Malawi, a DFID-funded NGO working in partnership with local chiefs was persuading men to share control of household agricultural land with their wives. In one community that we visited, the women reported that control over land enabled them to ensure that the proceeds of their own agricultural activities were used for the benefit of the family. 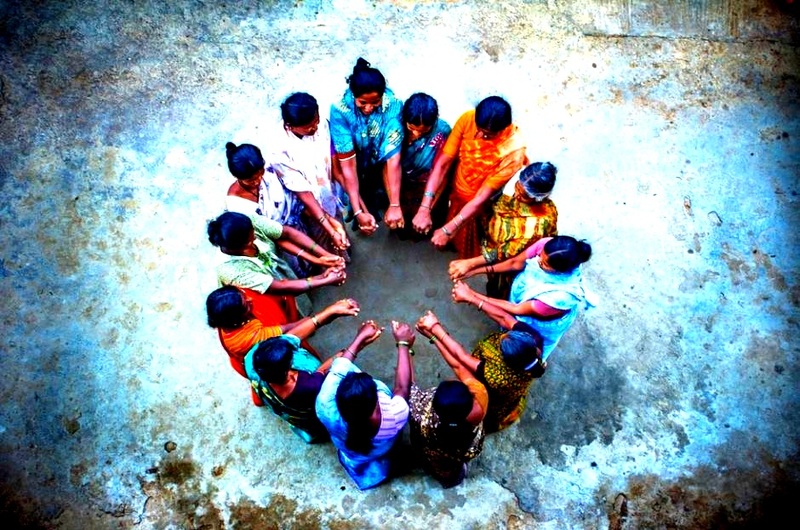 According to the women, once they are able to establish themselves as contributors to the household economy, they are, over time, less likely to be victims of abuse and violence. According to the Malawi Police Service, a large majority of the aid-financed reforms undertaken over the past 15 years, including community policing, human resource management processes and fingerprint and criminal record databases, either collapsed or were substantially curtailed as soon as external funding was withdrawn. Though the lack of sustainability is well known, DFID has no explicit strategy for addressing it. We saw no examples where proposals for new S&J services were shaped by analysis of the government’s willingness and capacity to pay for them. In its paralegal programming, DFID does not always distinguish between capacity development and the direct funding of service delivery. The sustainability challenge is not just a financial one. It is also a question of whether there is a credible vision for reform of S&J institutions within the country in question, which DFID can support. In the interim, it may be legitimate for DFID to invest smaller amounts in activities designed to explore, test or build potential political commitment to reform. Without that commitment, however, institutional capacity building is likely to produce only pockets of success, rather than transformational change. DFID programmes should [but are not] distinguishing between interventions that are based on sound evidence and those that are experimental in nature. While the former can be implemented immediately at scale, the latter should be tested through exploratory programming, supported by suitable monitoring and evaluation systems for capturing the results. There is very little use of piloting as a learning exercise within the portfolio. Sometimes activities that are implemented on a limited scale are described as pilots but are not part of a structured process of testing options and capturing lessons, for replication on a wider scale. There was evidence in both Malawi and Bangladesh that interventions that had proved promising in rural environments, in relatively stable and homogenous communities, might be difficult to replicate in more fluid and diverse urban settings. Given the pace of urbanisation in many DFID priority countries, this is likely to be a key programming challenge for the future. We found numerous instances of inappropriate indicators or unreliable data collection methods. In Sierra Leone, an initiative to strengthen local courts was measured through an indicator on the number of local court cases overturned on review. The annual review found that the indicator was misleading and irrelevant, in that it might capture a stronger review process rather than improvement in the quality of local court judgments. In Bangladesh, the paralegal programme was measuring the numbers of prisoners on remand but not their average of time on remand or the numbers held on remand beyond the legal time limits. This entry was posted on March 26, 2015 by Christina in General, Reports.